United Soccer Leagues announced today the addition of former A-League, Major League Soccer and US National Team stars John Doyle and New Jersey native Peter Vermes to the USL staff as Super Y-League ODP Technical Directors. TAMPA, FL – United Soccer Leagues announced today the addition of former A-League, Major League Soccer and US National Team stars John Doyle and Peter Vermes to the USL staff as Super Y-League ODP Technical Directors. The pair will be responsible for overseeing and developing the SYL national scouting network to identify players for US National team programs. Both Doyle and Vermes will jointly work together with the Super Y-League Regional Staff Coaches to ensure that the scouting system is properly identifying the top youth soccer talent in the US and American based players in Canada within the SYL. This includes developing scouting initiatives, expanding the scope of the scouting process, aiding scouts with identification techniques and working with US Soccer National Staff and Team coaches. The pair, who are also athlete representatives to the US Soccer Board of Directors, will also be present at each of the Regional Identification Weekends and the League Finals to aid the National Staff Coaches with the scouting of players. Through the professionalized system of USL, plans are also being developed for the duo to oversee a team comprised of the top youth talent in the league on an overseas tour to expose players to top European professional clubs. Doyle recently finished his playing career after five years with San Jose in Major League Soccer. In his five years as a defender for the Earthquakes, the two-time MLS All-Star and 1996 MLS Defender of the Year logged over 11,000 minutes of playing time and tallied 11 goals and 15 assists. Prior to MLS, Doyle played professionally in the A-League and overseas in Sweden and Germany. He played two seasons with the San Francisco Bay Blackhawks, helping the team capture the 1991 APSL championship. In 1995, Doyle was named the APSL Defender of the Year while playing for the Atlanta Ruckus. Doyle also enjoyed a lengthy tenure with the US National Team from 1987-94. He played in the 1998 Olympics in Seoul and 1990 World Cup in Italy. He made 53 appearances with the national team, recording three goals and two assists. Vermes, who announced his retirement as a player last week, joins USL after finishing his career with the Kansas City Wizards last season. Vermes helped lead the Wizards to the 2000 MLS Cup title in his first of three years with the club. 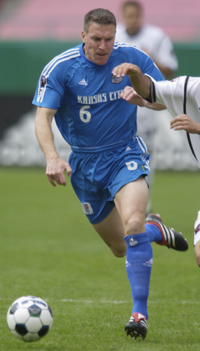 Prior to joining Kansas City, the 2000 MLS All-Star and MLS Defender of the Year spent three seasons in Colorado with the Rapids. He began his MLS career with the MetroStars in 1996. Vermes tallied 11 goals and 17 assists in MLS while logging over 16,000 minutes. He ranks seventh on the All-Time MLS list in minutes (16,465) and fourth in the single-season minutes with 2,916 in 2000. Prior to MLS, Vermes played abroad in Spain, Holland and Hungary. He was the first American to play in the First Division in Holland and Hungary. He played for Figueras (Spain) in 1991, FC Volendam (Holland) in 1990 and Raba Eto (Hungary) in 1989. Vermes also enjoyed a lengthy career with the US National Team from 1988-97 with additional call-ups for training in recent years. He played in the 1990 World Cup in Italy and the 1988 Olympics in Seoul. The 1988 Chevrolet Athlete of the Year made 67 appearances and has scored 11 goals, which ranks 10th All-Time for the Men’s National Team. He also ranks 13th in points (25) and 20th in games started (59).